Here's a guide to show you how to let a user teleport by using any furni! 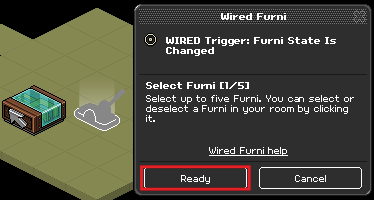 Use the WIRED Trigger: Furni State Is Changed and click the useable furni, then hit ready. 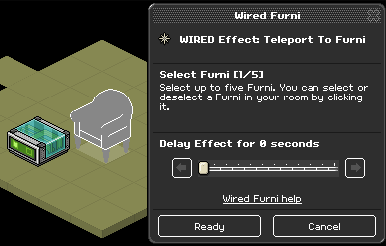 Use the WIRED Effect: Teleport to Furni and click the furni you wish to be teleported to, adjust the delay of the effect if needed, then hit ready. Stack the Trigger over the Effect the way it is shown ﻿in the picture shown below. You are now finished, and here's how it will go when you activate the WIRED. We lookin' great with this hair.